Question: How can you sell your nitro vehicles so cheap, is there a catch? Are they used? Question: Are all your nitro vehicles RTR (ready to run) and what else will I need to operate them? Question: Can I run 2 different cars at the same time, can I request 2 different frequencies? Question: I have always wanted a Nitro RC Car, now that I have one how do I run and care for it? Question: Where are you located and can I come to you to pick up my item? Question: How do I contact RC-Tradingpost? Question: When will you ship my item and will I receive a tracking number? Question: Do you offer express shipping service? Question: Do you ship to Alaska, Puerto Rico, Hawaii, P.O. Boxes, Military Addresses etc.. Question: Are there taxes on my item purchases? Question: Do I need a Paypal account to purchase through your website? Question: Why was my purchase declined or payment refunded? Question: How do I pay with a money order? Question: What do I do if my product arrives defective? Question: What do I do if my product arrives damaged? Question: What do I do if I have received the wrong item? Qeustion: What are the Terms and Conditions for www.rc-tradingpost.com items? Question: What do you do with my information? Do you share it with anyone? How can you sell your nitro vehicles so cheap, is there a catch? Are they used? Answer: There is no catch, and EVERYTHING WE SELL IS BRAND NEW IN THE BOX DIRECT FROM THE MANUFACTURE. We deal in volume. Most website try to make a fortune on each vehicle they sell, these same nitro vehicles we sell for under $200 we have found at other websites for $300+ each , and yes these are the exact same vehicles sent from the exact same warehouse. We want to make the nitro RC hobby available for everyone. Are all your nitro vehicles RTR (ready to run) and what else will I need to operate them? Answer: Yes all of our nitro vehicles are RTR (ready to run) complete with radio systems installed (unless noted by "kit"). You will need 12 AA batteries, 10-30 % nitro fuel, and a nitro starter kit. You will also need patience and preferably an experienced nitro hobby friend to help you learn this fun, exciting, and challenging new hobby. Can I run 2 different cars at the same time, can I request 2 different frequencies? Answer: Most of the items are shipped with random frequencies and therefore we cannot guarantee different frequencies will be sent. However, on all of the hobby class vehicles, the crystal sets can be changed to allow up to 6 vehicles to be run at the same time. All hobby shops will carry these sets for around $10. Where are you located and can I come to you to pick up my item? Answer: We are located in historic Post Texas at 211 East Main Street downtown. Please come by and see us if you are in the area. We are about 30 minutes Southest from Lubbock Texas (Home of Buddy Holly) . Shipping rates are based on weight and size of order. Simply add the items to your shopping cart and it will show you the exact shipping charge to your location. Do you ship Internationally? Answer: Yes. When will you ship my item and will I receive a tracking number? Answer: We will normally process your order and ship within 3-4 business days (Monday -Friday). Once shipped, it will take an additional 2-5 business days for your item to arrive at your location (international order will take a little longer depending on customs). As soon as your shipping label is created we will forward all tracking information so you can monitor it's progress, we will normally send your tracking information the next business day after your purchase has cleared, receiving your tracking number does not necessarily mean the item was actually picked up from our store. It may not show movement until 1-4 business days from receiving your tracking number. During peak holiday seasons it may take a couple more days to process your order. Please be patient during these times as the shipping companies are simply overloaded. You must monitor your packages progress with the shipping company ( i.e. Fedex, UPS, USPS, DHL, etc..) by checking your tracking number often. We currently do not offer signiture required services on all of our delivery options, therefore you will be responsible for receiving your package. If no one is going to be home to receive your package then call the shipping company to reschedule the delivery date or arrange for other options. We are not responsible for the package once the shipping company has it in there possesion and we will not refund any payment for claiming non receipt if the tracking number shows the package was delivered. You must agree to these terms before you purchase. Do you offer express shipping service? Answer: Call us to arrange. Are there taxes on my item purchases? Answer: Texas residents will have an 8.25% sales tax added to the price of their item purchases. Residents of other states will not be charged a sales tax for their purchases. Do I need a Paypal account to purchase through your website? Answer: No, we accept all major credit cards, debit cards, checks and money orders. Why was my purchase declined or payment refunded? Answer: If we refunded your payment, it is because your "ship to" address is not a "confirmed" address, ("ship to" address must be the same as the address on file with your credit card company). With the ever growing risk of Internet fraud, this helps to protect us and the card holder from fraudulent purchases. If your payment was refunded, and you are not sure how to confirm your address, contact your credit card company. Your "ship to" address can be different than your home address, if you have your credit card company add the second address to your account information. You can also contact Paypal Support toll free at 1-888-221-1161 to speak to a customer representative. Thank you for your understanding and help in fighting internet fraud. Be sure to include your email address so we can contact you with your tracking number. What do I do if my product arrives defective? What do I do if I have received the wrong item? What are the Terms and Conditions for www.rc-tradingpost.com items? What do you do with my information? Do you share it with anyone? 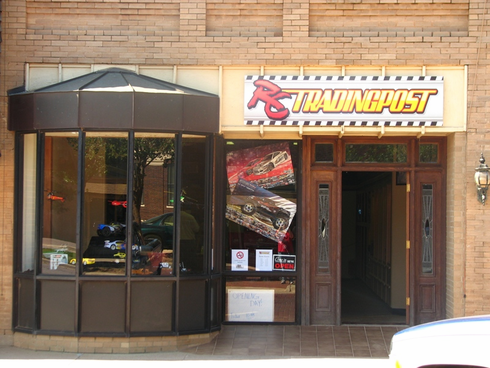 How do I contact RC-Tradingpost?